Well folks, my freezer is basically full. A mule deer, antelope, and a share of an elk has it busting at the seams! Venison polish sausage, summer sausage with jalapeno and cheddar, burger, steaks and roasts, you name it! It's probably a good thing that I didn't get a bear also! My wife is actually happy about it too! We don't need to buy any meat for months! But it still won't stop me from chasing whitetails in the northland in only a couple weeks! My stands look to be in great spots! And the weather seems to be cooling off just right. Opening day is later this year as well, so I expect the bucks to be more active right away. But I'm betting on the 2nd weekend to be the best time for rutting activity this year. We have plenty of scrapes and rubs already so the bucks are ready, now we just need the does to do their thing! And my dad drew a wolf tag again this year! He is an official gut pile hunter this year yet again! Lucky @$%#@#! I think my sleepless nights will begin this weekend. Anyone else pumped yet? How about some good pic's? I am right there with you on the sleepless nights! I have had my full group of gents out to groom trails and cut shooting lanes. We upped our equipment this year with a "Facebook" garage sale find. We stumbled on a $300 dollar trail mower that need $50 worth of work. All of our trails are now adapted for the mower. In my area which is known for slow acting bucks are starting to rub this last week. My 8 year old daughter is still pretty admit about getting into the stand on opener... weather could be a factor... I don't want to ruin such a fun event for her by being cold. I might have to wait for an evening hunt. Maybe I will wander a trail or two this weekend and snap a few pics. Yep, the sleepless nights started Sunday night, I was up 3 maybe 4 times. Time change, cool weather, snow in the forecast, hunting gear piling up in the garage...the list is still growing but booner is my dreams!!! As you know I butcher deer on the side... $50 bucks! But I have now did a few Archery deer for people and its starting to get real! I have all the orange washed, the knifes and lights out, took a partial stroll to check the scrape lines.... oh boy... cant wait! I think I actually cant wait to see my boys shoot one! I know what you are getting at with your boys! There's no feeling like it. It took my son 3 years to get his 1st. And over that time he never once complained, whined, or even moaned. He had chances at does, but wanted his first to be a buck...and man did it turn out well for him! 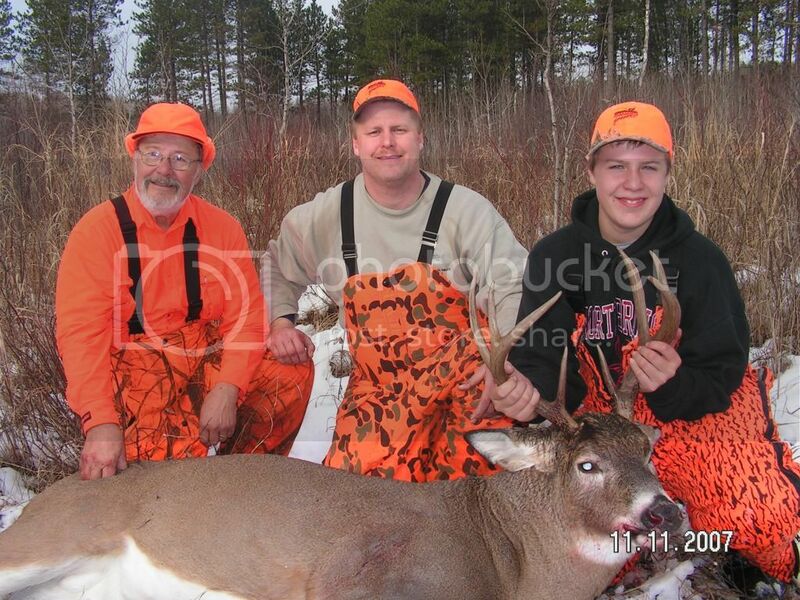 3 generations of deer hunters and a massive bodied 8 point buck. We all hope to be this lucky this year! And if you are paying attention...yes that's my lucky sweatshirt! My wife doesn't get it either, since I've had to rescue it from the garbage more than once! I'm getting the itch as well. I've also had several sleepless nights lately but thats mostly due to a teething 5 month old baby in the room next door. This years trip is a little bitter sweet. Its always great to get out with the guys and into the woods. But my wife isn't real excited about me being gone and leaving her alone with a cranky kid. Also just found out tonight that one of my best hunting buddies can't make the trip. He started with a new HVAC company not long ago and they are making all the crews work on Saturday of opener. He hasn't been there long enough to earn time off or build up any good will so he'll be back home working. I'll be sure to send him plenty of pictures from the stand to help get him through it. Only a couple more days and we'll see if the new spots I found pan out. Good Luck to all and Be Safe, Hunt Safe!